Technology now allows us to learn in a much more comfortable and effective way. The benefits of classroom learning are obvious, but to further those benefits, we can now combine digital and online media to classroom training. Companies that continue to stick to traditional methods of training employees are not taking advantage of their increasingly mobile workforce, as blended learning is now providing a more targeted and highly customized training experience. The merging of offline and online methods of training is the growing trend. According to a research, “more than 45% of training hours are performed in the classroom, 27% is delivered with blended learning techniques, 24.7% is delivered via online or computer-based technologies, and 1.1% is delivered via mobile devices.” By combining traditional methods of training with modern methods of content delivery, businesses are getting more ROI from their learning and development budgets. In the U.S., companies spend approximately $135 billion each year on employee training. Eduardo Salas, a professor of organizational psychology at the University of Central Florida, says, “Most of what companies spend is not utilized because of obsolete training methods.” Other research suggests that almost 90% of the new skills achieved during training are lost within a year. They infer that what occurs during training is not the only thing that matters; what occurs before and after training is just as important for the success of a training program. As an example, when an HR manager is asked to get a team of employees in the sales department trained in retail sales skills, the manager faces many obstacles to meet company needs. The first obstruction is that each employee has different learning abilities and training needs. The second obstruction is that the ROI cannot be accurately tied with training budgets. The third obstruction is to link learning received in class to the specific company needs. If these obstructions cannot be overcome by the HR manager, then the resources spent on training get wasted. The waste is significant, as the company loses both time and money without achieving the expected improvement for which the training was delivered in the first place. And both the HR manager and Sales Manager are placed in an uncomfortable position with little to no results to show from their efforts. 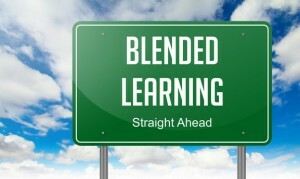 Blended learning is the most sophisticated solution available today to overcome training obstacles such as these. It uses different communication mediums available to us, and allows us to customize the training based on specific company needs. To meet company goals in providing training to its employees, blended learning uses different methods of communication and styles of training. Why? Because they help to meet specific company needs that cannot be met only through face-to-face classroom learning. Customization of training is done before the training by matching company/employee needs with the training materials and gaining an insight into each participants learning style. Content for the training is created after a learning and development professional communicates with the company the specific outcomes they expect from the training sessions. This customization can be a simple chat on the phone or a multi-day, onsite assessment of employee’s on-the-job skills. When utilizing an experienced and professional trainer, some customization is done on the fly as questions are asked by the group. This is done during the training by teaching what is relevant to the goals of the company/employee in terms of their job and allowing participants to create “user generated content” through their input. Training should be targeted to help employees to achieve the company goals. Customization can be implemented after the training by providing the trainee with online reinforcement options that may include free elearning, LDP profiling, using online FAQ’s, getting support online, watching videos that relate to the training, reviewing the training courseware from a smart device, discussing content with peers and subscribing to other support materials. In other words, in blended learning, the trainer is always available to the trainee, even after the physical training session is completed. 28.3 percent of hours are delivered with blended learning techniques. 25.9 percent of hours are delivered via online or computer based technologies. 16 percent of hours delivered via Virtual classroom/Webcasts. 3.3 percent of hours delivered via social learning. With the benefits that technology is bringing to us, it is inevitable that more and more organizations will adopt this more effective method of learning and development to reduce waste and improve LnD results.